Automatically open web page on login. 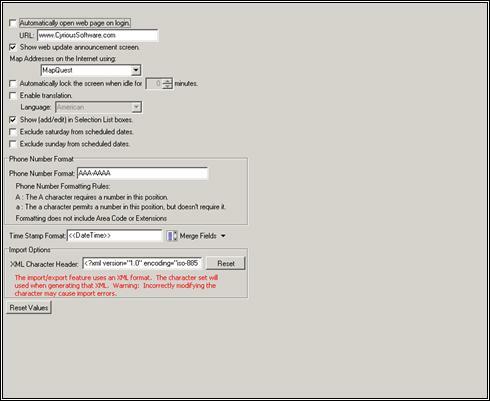 If this option is selected, a web page of your choice will open automatically when the user logs in. If this option is not selected, no web page will open automatically. URL: [ text entry ]. This text entry field allows you to enter the URL of the web page you would like to open. Show web update announcement screen. If this option is selected, the web update announcement screen will show. If this option is not selected, web updates will not appear. Map Addresses on the internet using: .This option lets you choose an internet site to map addresses. Automatically lock the screen when idle for minutes.This option allows you to have the screen automatically lock after it has been idle for a certain period of time. If you set the scroll box to 10, the screen will automatically lock after you have been idle for 10 minutes. Enable translation. When this option is selected, translations will be enabled. If this option is not selected, you will not be able to translate to other languages. Language: .This option allows you to set your default language. Show (add/edit) in Selection List boxes. If this option is selected, the add/edit buttons will be shown in the Selection List boxes. If this option is not selected, the feature will be unavailable. Exclude Saturday from scheduled dates. If this option is selected, Saturday will be excluded from scheduled dates. If this option is not selected, you will be able to schedule on Saturdays. Exclude Sunday from scheduled dates. If this option is selected, Sunday will be excluded from scheduled dates. If this option is not selected, you will be able to schedule on Sundays. Phone Number Format: [ text entry ]. This text entry field allows you to enter a phone number format. The format you enter here will be the phone number format that all phone numbers will follow. A: The A character requires a number in this position. a: The a character permits a number in this position but doesn't require one. Formatting does not include Area Code or Extensions. Time Stamp Format: [ text entry ]. This text entry field allows you to enter a time stamp format. The format you enter here will be the format for all time stamps. XML Character Header: [ text entry ]. This text entry field allows you to enter an XML character header. The import/export feature uses an XML format. The character set will be used when generating that XML. Warning: Incorrectly modifying the character may cause input errors. Home Dashboard [ list selection ] - This selection list allows you to choose the dashboard that will appear when users log in to Control. 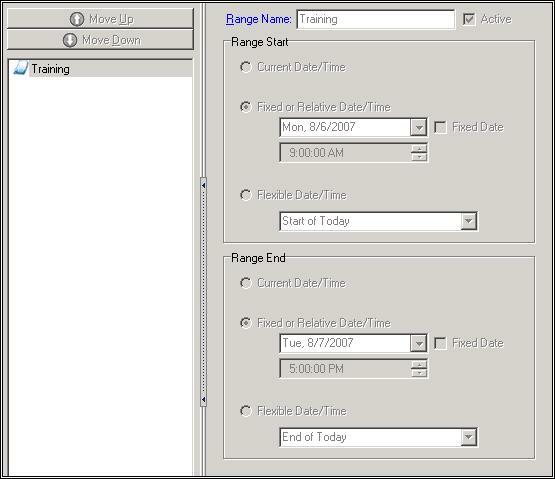 This option allows you to define custom date ranges for use in Activity Manager. Enable Bar Coding. If this option is selected, you will be able to use barcodes. If this option is not selected, you will be unable to use barcodes.